Deirdre is an insatiable reader, and moved from mysteries and mythology to science fiction and fantasy back when reading speculative fiction made you Weird with a capital W. She has published both stories and poetry in venues including MZB's Fantasy Magazine, Crossed Genres, With Painted Words, and The Best of FridayFlash Volume One. 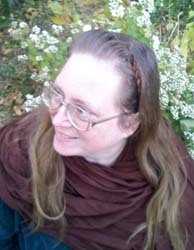 In 2010, she became one of the primary creators of Torn World, a shared world science fantasy world that includes fiction, poetry, art, and worldbuilding. You can find her blog at Wyld Dandelyon's Worlds. What if the magic in fiction drifted into the real world? Anne's partner was gone, her body drifting in space. But is that the end of the story? When the full moon's magic has had its way with you, what will your mouth taste like? Green rain can really ruin a girl's day. When a dog not only chases, but attacks the local cats, what's a kitten to do? A child develops a plan for how to deal with the night-time monster. Four friends in a graveyard, late on Halloween night. An old lady sits on her favorite beach, contemplating the sands of time. This story is fiction about a fan, not fanfic. Have you ever wanted to walk into the fog, and disappear? It's an old custom, sleep on a piece of wedding cake, and see your true love. Does it really accomplish anything but squashed cake? What makes it worth looking at tacky Christmas stuff on Halloween? A favorite granny is asked, "Why are we all different?" This story is set in the world of Fireborn. What is art, and how do we determine its value? Or maybe, the question is: Who gets to determine its value" This is the first appearance of my moss-haired twins. What if the gift you want to give is already taken? The twins each have their own approach to finding the proper natal gift for their mother. Where'd the bum get the clean blue hat? And where'd he get the tiny, beautiful painted pebbles? Do computer stores need brownies? Torn World is a shared world science fantasy setting, with all sorts of exciting creative work going on, including but not limited to fiction, art, and poetry. See all of Deirdre's Torn World fiction, artwork and poetry at her contributor's page. For your reading pleasure, here are some of my poems and lyrics. Fair warning--some of these posts contain prose as well as verse.